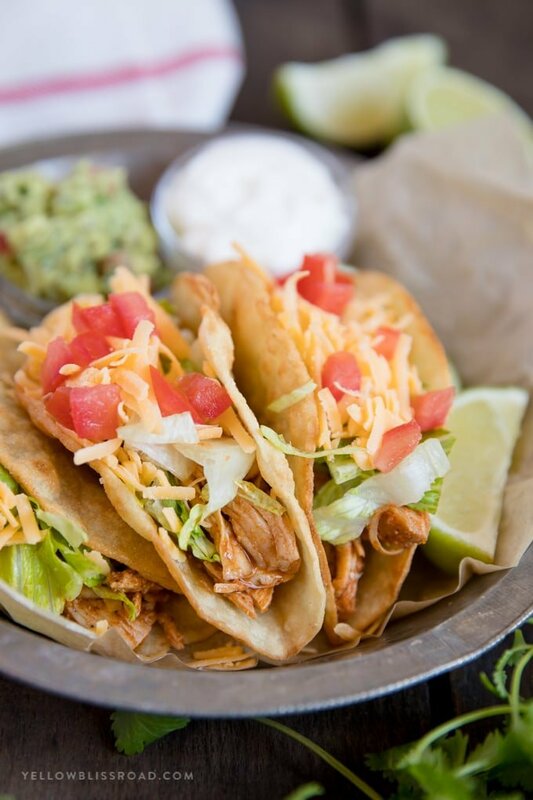 My Easy Chicken Tacos will be the highlight of your Taco Tuesday! 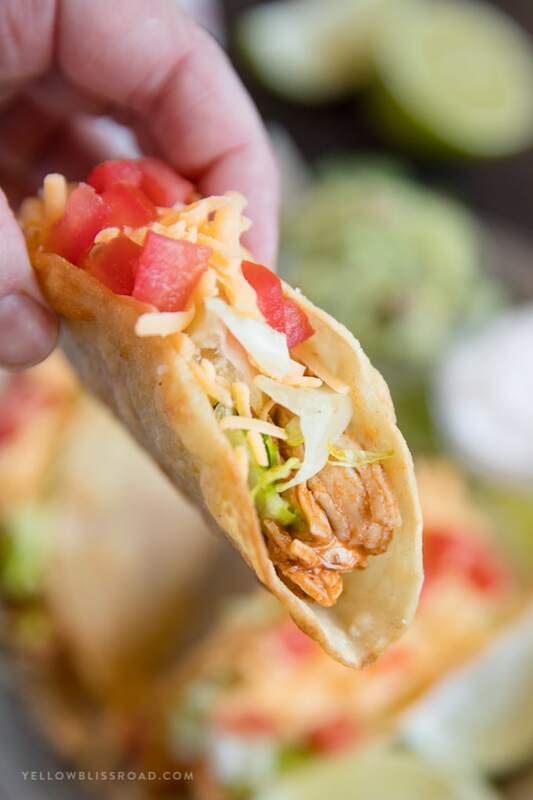 Tender, juicy chicken breasts are seasoned with a simple homemade taco seasoning and simmered to perfection, creating the best chicken taco you’ve ever had! I have a hard time ordering chicken tacos in a restaurant. Usually the meat is over cooked and shredded beyond recognition and simmered for hours in a sauce that creates a puddle on your plate. They might taste good, but the mess for me is almost unbearable. So I decided there must be a better way! To make my chicken tacos, start with boneless, skinless chicken breasts. If they’re frozen, thaw them out. Rub my homemade taco seasoning all over them and sear them in a hot skillet with a little butter and olive oil. Give them about 2-3 minutes per side so they get a nice golden sear. This won’t cook them all the way through but that’s ok, we’ve got a couple more steps. Once the chicken breasts are seared on both sides, turn off the heat and use a large metal spoon to scoop the juices from the pan all over the chicken. Do this for about a minute, then cover the pan and let it sit right there on the stove. The heat will continue to cook the chicken for about 8-10 minutes or until it’s no longer pink inside. This is when you can start prepping your taco toppings. Remove the chicken from the skillet and transfer it to a cutting board. Using two forks, shred the chicken into big chunks. To the skillet, you’re going to add some garlic, a little bit of chicken broth and tomato paste. whisk it together while bring it to a boil. Add the shredded chicken pieces to the skillet and stir to coat them in the sauce. Let it simmer for about 5 minutes. Finish cutting up all of your favorite taco toppings while the chicken is simmering in the sauce. But you can add any toppings that your family likes! Warm up some tortillas in the microwave for chicken soft tacos or bake some tacos shells in the oven. My favorite way to enjoy chicken tacos though, is in homemade taco shells that we’ve fried on the stove. Indulgent, sure, but so crunchy and delicious! 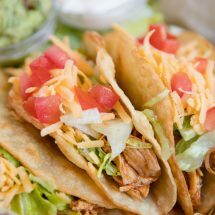 If you’re going to make your own taco shells, be sure to use corn tortillas, and make them before your taco meat then keep them warm in the oven. This way your meat isn’t getting cold while you’re trying to fry up the shells. We also love this meat in my Chicken Taco Salad! Chicken Tacos go great with some Mexican Rice on the side. Season both sides of each chicken breast with the salt, then rub in the taco seasoning. *If the chicken breasts are especially thick, pound lightly with a mallet first to even them out. Heat 1 tablespoon of olive oil and 1 tablespoon of butter in a large skillet over medium heat. Add the chicken breasts to the skillet and cook for about 2-3 minutes per side, or until each side has a nice golden sear. Add the other tablespoon of butter to the skillet and melt. Turn off the burner and spoon the juices form the pan over the top of the chicken. Cover and let sit for 8-10 minutes or until chicken is cooked through and no longer pink. Transfer chicken to a cutting board and shred into large chunks. Set aside. To the skillet, add the chicken broth and tomato paste and whisk to combine. Return the chicken to the skillet and simmer, covered, over medium-low heat for 7-8 minutes. 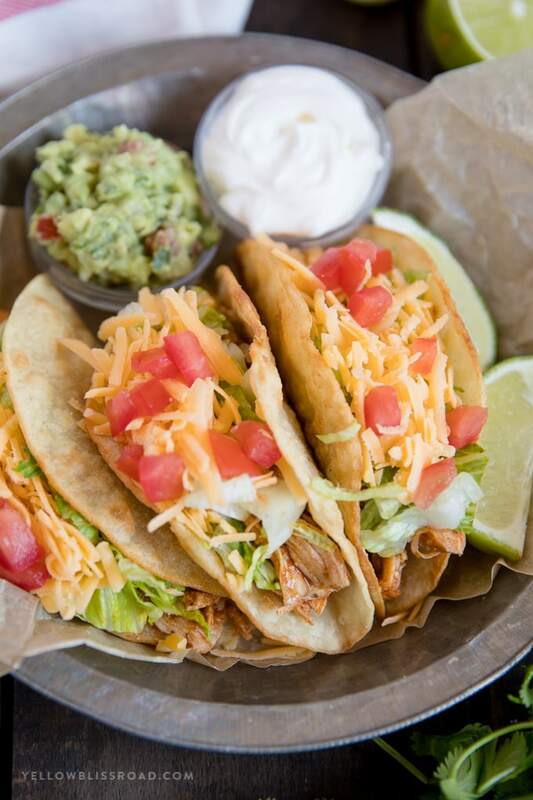 Serve in taco shells or soft tortillas, topped with lettuce, cheese, tomatoes and any other favorite toppings. You can also use this chicken in burritos, quesadillas, nachos or salads. Or serve on it’s own with a side of Mexican Rice. *Notes: If you have pre-cooked shredded chicken, skip the first 2 steps. 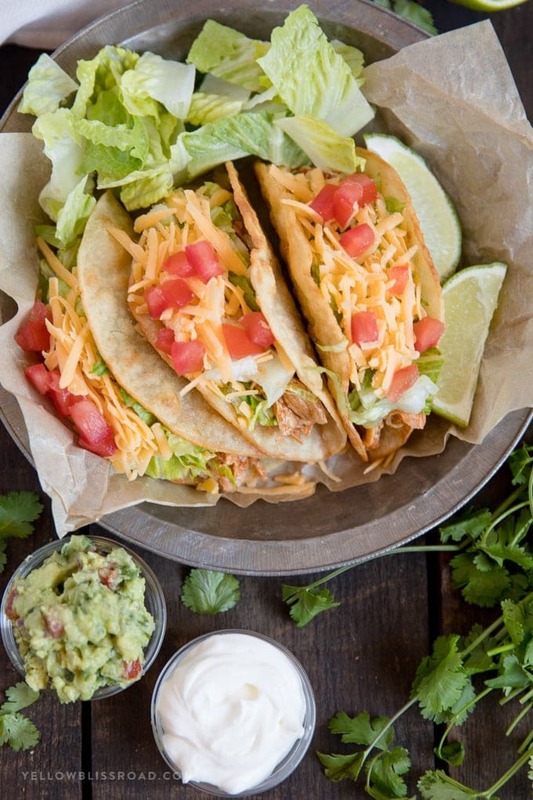 How do you do your homemade taco shells? Super easy! Heat an inch or two of corn or vegetable oil over medium heat. When it’s hot (a drop of water will sizzle), add the tortilla for about 30 seconds, then grab one end with tongs and fold it up. I use a wooden spoon in the cent to keep the shells from folding too tight. Then just fry until crispy! Takes maybe 3 minutes per shell. These look amazing! Thanks for the tip on the chicken breasts in the skillet. I almost always seem to overcook chicken when it’s on the stove!